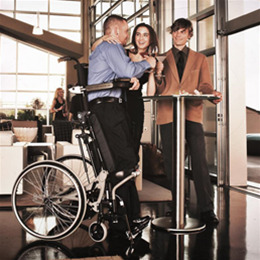 The Helium LS and LSE are ideal for people who need to stand up, but are unable to do so on their own. The LS offers a manual standing feature, while the LSE provides a power function. Both chairs are constructed of innovative, high tech materials and ergonomically-friendly. Armrests, knee supports and a chest belt help ensure comfort and stability, while a rear axle center of gravity adjustment provides superior maneuverability.The LS and LSE allow users to participate in everyday activities with their family, friends and co-workers. The ultra-lightweight frame makes it easy to take the Helium almost anywhere. The chairs also support an array of medical benefits, such as: increased muscle tone; strengthened bones; improved circulation and digestion, as well as reduced spasticity. Seat Widths 14", 16", 17.5", 19"
Backrest Heights 12.5", 16", 20.5"